Adequate hydration, well drained soil and a healthy plant will ensure good blooms but there is something else you can do. If you have Camellia japonica planted in your landscape, winter can be a frustrating time. Camellias are famous for two things, glossy dark evergreen foliage and the potential for abundant flowering in the dead of winter. Unfortunately, and all too often, camellias are not living up to their full potential. 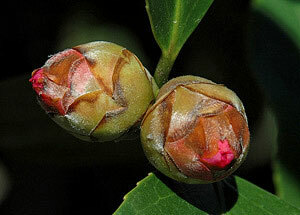 I’m often asked why Camellias that can be loaded with flower buds actually fail to ever bloom. Most of the time these buds simply end up turning brown and dropping from the plant before they ever flower. If this happed to your plants, you may only be guilty of poor placement or wrong variety. Harsh winter winds and unfiltered sunlight can dry out the plant tissue to harmful levels. Camellia japonica is notorious for falling victim to inconsistent winter weather. Widely fluctuating temperatures really wreak havoc with this species. Picking a newer variety that has been bred to withstand more extreme temperatures will help greatly. However, for the rest of us, many of our plants are several years old or more. They are not tolerant of temperatures much below freezing when the plant is full of buds. There are some simple steps you can take to help protect the plants and one step which although more involved, could ensure you get flowers out of those buds before winter sets in. First, the easier steps. Make sure your plants stay consistently watered. A steady supply of water could provide the necessary hydration your plants need to move from flower buds to full flowers. However, camellias can’t stand poor drainage and wet feet. Be sure your plants drain well. Next, a healthy plant is a more vigorous one, and better able to withstand extremes. Camellias aren’t heavy feeders, but occasional supplemental fertilization may make the difference. Covering the plants can provide marginal protection from light frost. But even then, the cover should rest above rather than against the blooms, and for optimal protection, it should go all the way to the ground and secured there. In this way, you will be taking advantage of trapped ground heat. One note of caution, if you cover your plants, make sure to remove it the next morning or you may cause even more damage. Now for the grand finale. If you really want to give the camellias the best chance of flowering before freezing temperatures do them in, try applying a drop or two of Gibberellic acid to each bud. It’s not as bad as it sounds. Giberellia is a growth hormone found in small amounts in most plants. This compound has been formulated into an application that is now readily available and safe to use. A drop or two at the base of each bud in the fall (referred to as “jibbing”) can produce full blooms in just a matter of weeks, well ahead of threatening weather. You can learn more about this process as well as detailed information by contacting The American Camellia Society. This year has been one of those years in my garden. I don’t have the time to “jib” my buds, so I appreciate them for the beautiful evergreen foliage provided in the cold stark months of winter, even in the shadiest of spots. I have an Elain Lee Camellia bush Mail ordered from Camellia Forest Nursery about 7 years ago. This bush does very well at the north west corner of my house. The Zone is 6A, Location rural Halstead, Kansas, about 30 mi. north of Wichita. Sometimes it Blooms if the fall is mild enough. I have tried many varieties of cold hardy Zone 6A & B Is there any variety that would have Zone 6A hardy flower Buds I am Looking For An Ashton Prelude Camellia Bush to try as a fall Bloomer. Can not find one.have suggestions for me. I would leave it all as is Lisa. Sounds like they are co-existing peacefully by what you describe. Moss typically is not a parasite that will harm the plant. And if there are tons of blooms, I say all is well. Good luck. Hello, I bought some Giberellia for my camellia. It was powder form but you say to put a drop or two on a bud. Does it come in liquid form as well or can I add water to it and then apply as a liquid. I have a seeding that I rooted last year that is about 8 inches tall and it had two blooms on it. Needless to say one, bloom dropped off so I wanted to try the Giberellia before the next bud drops. Thank you for any input. Patsy, I’ve only used it as a powder that you mix with alcohol and then apply. Oh!!! And by the way… I’ve pinched off all buds and left only one per branch. I have an indoor camellia plant here in central Massachusetts. I’ve had it for 4 years and it’s grown beautifully from a tiny 4 inches to about 2 1/2 feet now. It’s had a few blooms every winter, but this winter it’s loaded with buds. I had one open at Christmas, but the rest are plump and green, but they won’t open! I’ve not moved its located or fed or watered it any differently than before. The overall health if this plant looks great except for this one odd thing. Can you help me to get these buds to POP?! I’m in charge of maintaining the landscape in my sister’s yard this year. The previous years were overseen by a well-meaning but poorly-educated landscape crew. So far, I’ve had to do a lot of corrective work. What’s puzzling me the most though is a pair of camellia topiaries flanking the back door. They are each around 6 or 7 feet tall and have three globular tiers about two feet across. To my knowledge (and my sister’s) they’ve never bloomed. I believe it has something to do with the continual pruning and shaping to maintain the topiary shape. My goal is to encourage blooming for either this year or next. Since the topiary shape is so pronounced I feel I must somewhat maintain it in order to prevent the plant looking entirely ridiculous. We live in the San Francisco Bay area (zone 9b) and my sister’s yard gets plenty of sunlight. Thanks to El Nino this winter we’ve also had an abundance of rainfall. The plants look completely healthy, if pruned unnecessarily tight in my opinion. Any advice to offer on remedying this situation? Hi Chloe. My first inclination is that this is def. a pruning issue. All the buds that would become flowers if given the chance are being cut off before they ever have a chance to bloom. I don’t know if there is a way to keep it clipped to keep its shape and promote blooming. The key is that you have to give it a chance to produce flower buds and then bloom, before you cut the branches back again. While camellias respond well to pruning, if you want flowers, next season, you’ll need to do your light pruning right after they finish blooming. Then leave it alone until after the next year’s bloom. I have small bushes, numerous buds but no flowers. These bushes are in a sunny yard, east and north sides of house. I bought the home in March and tried to water the bushes really well this summer, with our daily temps in the 90s (west central GA). I wonder if poor drainage might be an issue? What are steps I could take to ensure good drainage? I don’t think drainage is causing your plants to not bloom. Try removing many of the buds so that you leave a number on the plant that can utilize whatever nutrients are in the plant to help force blooming. Too many buds all at once is a lot of demand on the plant. Also, a light fertilizing in spring and early summer will help with an all purpose fertilizer to ensure the plant gets what it needs. If this is a camellia, they are not opposed to water. But if you want to improve drainage (without digging up the plant), then make sure you are diverting any water upstream so that it is not collecting in the area where your plants are located. I downspout next to a house is a common way that certain plants get too much water. I live in NC and was wondering if there is a camellia that will truly be in bloom during Christmas? I was hoping for a true dark red or white one. I was told I need a late blooming Sasanqua or a early blooming Japonica? I cannot find descriptions that tell the month in which a camellia blooms. Is there a list somewhere that gives this information?? Hi Carlie. While there are many fall blooming camellias that bloom around Christmastime, I’m going to suggest you contact my friend Gene Phillips at The Camellia Shop. Your options are greatly reduced depending on where in NC you live. Gene is super passionate and knowledgeable about all things camellia and grows so many varieties. Here’s his link and tell him I said hello! I live in southern Il. Too cold for a outside camellia is it possible to have one as a house plant and if so will it bloom? I live in northern Florida in a home surrounded by maybe 15 probably 40 year old camellias. This year I bought some JIB in a small bottle from the camellia society. It came with a syringe, and I was told to choose two tender branches (one on each side of the tree), scrape back the bark a little and apply one drop in each place. But on a Mobile Camellia Society website, I think I am being told to put a drop at each bud?? What is the proper way to Jib my huge camellias? Should I cut them back by about 1/3 this year after they bloom, or before? Some are 8-10 ft tall. My name is Brie, I am the former grower and propagator at Camellia Forest Nursery. Traditionally Giberillic Acid is used as a means of making a few selected flowers larger for display at Camellia Flower Shows. It may be cumbersome to apply GIB to ALL the flower buds, hence the recommendation of two branches. You certainly can apply a drop at each flower bud- at least the ones you can reach as there is no harm in the application. As for pruning, I always recommend doing “reduction pruning” (1/3) AFTER the flowers bloom, before the new flush of growth. Camellia are very resilient, capable plants and respond well to pruning, so you really can’t go wrong. Only time will tell at this point Kelly. You have to wait it out and see how you plants look by summer. It could go either way. If they still look bad in summer with no new growth and losing leaves, that would be bad news. To look for dead wood, prune pieces starting closer to the top and work your way down until you can see green in teh stem. It should also be pliable vs. dead wood which is stiff and brittle. If your plants are alive, you might have to do some serious cleanup pruning to cut out all the dead wood / branches on the plant. I have a Japonica variety that has probably been at our home for at least 25 years, perhaps more. This year one half of it looks anemic and stressed. The other half is as lush and beautiful as always. A local nursery suggested trying Miracle Grow on the leaves, which I did. It seemed to help somewhat, but that half still has the “I’m going to die soon unless you act” look. Any suggestions? Hi Vickie. Wow, I’ve never heard of putting Miracle-Gro in leaves to fix a problem. Whatever benefit you saw I’m sure will only be temporary from this method. I believe the problem is more indicative of whatever is going on in the soil below. Has there been any disturbances to the root zone on the side where things look sickly? Has the ground been disturbed there and now drainage has been altered? Could the roots on that side of the plant be getting more or less water than the other side? A 25 year old plant such as a camellia is a tough plant so something has recently changed. You have to be a detective and investigate would could possibly be causing this? I live in central Calif between fresno & bakersfield. I have many camillia bushes that for some reason, the blossoms are inwards into the plant instead of blooming outside the plant. Is there something that I can do to prevent this. ??? Our summers are between 90-110 degrees, winter weather can be as low as 25 and as high as 60. Spring is usually in the 70’s. Thank you for your help. You can’t change the direction of the blooms on the branch but you can promote more outward growing branches if you’d like. Prune back branches by no more than a third of its length and follow the branch back to new leaf / branch buds facing outward as opposed to inward. Cut about 1/4 inch above this with a sharp pair of bypass pruners. I have a new camellia with buds that have been on the plant since it was planted about three months ago, in October. The buds are getting slowly larger and none of them have fallen off. How long will it take for them to open? I’m beginning to think they never will! Hang in there. As the article mentions, you can thin out the buds and promote or accelerate the remaining ones to bloom as described. it’s frustrating I know. I just lost a bunch of my flower buds to the extremely cold temps here over the last few weeks. Now they are all brown and falling off. You should check out the Camellia Society of America’s website. They have tons of great information along these lines and there’s no greater authority. That’s one of the things I love about gardening. Every day is different and always full of little surprises. I love that you celebrate those ah-ha moments like this. Thanks for sharing Jennifer. Right now the later-blooming Camellias I have are the Black Opal, a couple of Night Riders (very similar variety), a couple of Unryus (the twisty Camellia). I think their buds are all in pretty good shape despite a cold snap in December that got temps down in the 20s and teens for over a week. I also have a slew of early bloomers (Sasanquas) I have planted and now have begun to learn the realities with those. (Here in our zone 8 climate, that means I got some flowers in Nov and early Dec, the December cold snap killed quite a few buds, but now in January I am getting some flowers and there are more buds yet to bloom, so these should provide some flowers into Feb and perhaps March. Bottom line, you lose some buds in a cold snap but flowers in winter are precious so as long as those Sasanquas produce some blooms, then they are worth it. I am planning to plant some Japonicas. I figure at least in our climate here (Vancouver WA), most of the flowers should make it OK. If buds on the Sasanquas that were 1 month from blooming in early Dec survived the cold snap at that time, to bloom in Jan, then I figure the buds on Japonicas that may bloom in March or April ought to be small enough when we have a cold snap in December or January that they won’t get hurt much. But that is all speculation at this point. The one I have my eye on right now is the Magnoliaeflora Camellia. Monrovia says good to zone 8 while other places say 7. I am hoping to plant a bunch of those in a row but I will probably just try a couple the first year to see if they do OK. Of course, how they do will differ from one year to another depending on the winter weather, but at least one years experience will give me a little bit of data to go on. We shall see how things go. Another thought I have: Now cold hardiness no doubt is a factor in how well the Camellias withstand cold weather. I wonder whether flower size also is a factor? I suspect the ones with smaller flowers perhaps would be less sucsceptible to the buds turning brown because the buds will be smaller during the cold weather you are trying to get them to survive through. One Japonica that I suspect would have no problem in our area is the Spring’s Promise, with its extra cold-hardiness and small flowers. I actually like the smaller Camellia flowers better, although the color on the Spring’s Promise may not be quite ideal in the particular spot I want to fill with Camellias. One other thing I am wondering: The main spot I plan to put in Japonicas is a long row that used to be alternating red Rhododendrons and juniper shrubs. I tore out the Junipers and now plan to put Camellias in those spots. However, if the blooming of the Camellias overlaps the Rhodies then they might clash. From looking at shrubs around the city last spring, my guess is that Camellias will be done blooming by the time the Rhodies bloom. However, if the Camellias still have wilted brown flowers on them when the Rhodies bloom, then that might detract from the aesthetics of the Rhodies. Anyway, these will probably be lesser issues than I think, and I might be best off to just plunk down some Camellias and expect that most likely things will work out fine. I should add. Some other Sasanquas I have are a couple of Marge Millers and three Kanjiros. Those both had some nice blooms early. The Kanjiros didn’t have many more buds so there wasn’t much on them that got damaged by the cold snap. The Marge Millers did have quite a few more buds and most of those got browned out by the cold snap. The flowers on Marge Millers are fairly good sized, and that is one piece of data for my theory that larger Camellia flowers may be more susceptible to having their buds browned out in a cold snap. But my general observation is this: Early Camellia flowers will do fine because they bloom before the cold weather hits. Late Camellia flowers should do fine because the buds aren’t developed enough during the cold snap to be vulnerable to damage. The mid-blooming Camellia flowers are the ones that may get nailed. I suspect most Japonica flowers survive OK because of being late bloomers. All this, of course, is based on the climate we have where I live, which is zone 8. No doubt in colder zones the same Camellias will suffer more flower damage in a typical year than will be the case here. Our Camelia Japonica (anenome variety ) is in her early twenties. However she has always remained a dwarf although her leaves are a beautiful glossy green she does not disappoint with her budding. I am delighted that she did not drop her buds after the application of a Universal Blend of Superior Peat Moss and Moo Poo Kraal Manure added to the soil that surrounds her. She resides in a East Facing position adjacent to a Cabbage Tree with an overhanging rambling miniature rose that provides her with early morning filtered sunlight. I do confess that I never paid much attention to her individual soil condition other than the application of compost. The addition of the Peat to the soil must be agreeing with her and I am waiting in anticipation to see whether this will correct her stunted growth. Hi, I’m hoping you can help me. I bought a townhouse ten years ago. The previous owner had pulled up all the plants in the small backyard/courtyard, covered the dirt with plastic, and covered the plastic with ornamental white stones. I simply added potted trees and plants around the periphery of my courtyard. After a couple years, I removed the plastic because several of my tree/plants had grown right through their pots and the plastic (don’t ask me how) into the ground. At that time, I noticed a small plant growing through the plastic as well — it clearly was leftover roots of a plant that had been chopped off and left to die when the yard was covered. My friend, who was helping me garden, thought it was so pretty I should keep it. So I did. Everyone just called it “Pam’s plant” after my friend who saved it from being uprooted as a weed. The bush continued growing and did make a pretty shrubbery. Now, I don’t water a lot. I try to get low maintenance plants because I’m away on business so much. But last spring, my sister planted a rosebush into the ground near the shrub, so the shrub began getting more water, just because of its location. Imagine my shock when I noticed two tight buds on it one day — after nine years! it bloomed (after an interminable amount of time), and the flowers were GORGEOUS. Really drop-dead gorgeous white and pink dense peony-like flowers. So, I did some research and now I know the shrub is a camellia plant — I live in Sacramento, the “Camellia City,” which apparently has a soil that camellias love. In the course of my research, I’ve learned that camellias are typically a very fragile plant (!) that need constant watering (again, !). So, I’ve been watering it every day, hoping that I will get more flowers this year. My question is: how many flowers can I expect? How often does it bloom? What should I be doing to help it flower more often and more profusely? Thank you so much for your time and consideration; I look forward to hearing your advice. Mar 2012 NC had terrible hailstorm – stripped all my plants and trees – including the leaves and small branches on the top half of my camellia – it is about 7/8 feet tall, the bottom half is doing fine – in full bloom now at the end of Feb. but the top (about 4 feet) is not good! Can I just cut the top out and it continue to grow, or will cutting the main trunk stunt future growth? I read one of the entries and it said “topped the tree”. If topping is not good – what are the alternatives? Thanks. I am having difficulty getting my camelia plant to bloom. It is about 1 1/2 yrs old. It bloomed when I first got it, haven’t had a bloom since. I have good drainage, good soil and water consistently about 1 x per week with a good soaking and good drainage. Help !!!! Hi Michelle. All too often we get a plant from the nursery and it performed beautifully that first year. That’s because it’s jacked up on fertilizers and all the other tricks of the trade are used by the grower to make sure this plant looks great when you buy it and for some time after that. But, once the honeymoon is over, all plants have to settle into to their new, and different, and often less than perfect conditions until they can properly establish in their new home. So first things first, the plant needs to put on new roots, get to know the surrounding soil conditions and existing nutrients (or lack of), moisture levels, sunlight through the seasons and cycles, etc! And camellias are one of the best plants for long term rewards, but one of the SLOWEST to get settled in and start performing again. So as long as you’re doing you’re part, by providing the best location, good drainage but consistant moisture, a steady supply of nutrients VIA compost and organic matter (or other balanced fertilizer if you choose) and mulch over the surface, your plant(s) will duly reward you in time. I have 2 camellia bushes that are most likely 62 years old, planted when the house was built. This is the first year in the 40 years I have lived in the house that one of them has bloomed. In the fall, I thinned out the dead branches, topped it, and as it began to bud (which is always has, but they fall off), I debudded each double bud to 1. It worked. But it doesn’t appear to be opening completely. Maybe some of the growth hormone will help. Southern California has had a bizarre winter this year for sure. 80’s one day, 50’s the next. The poor plants are as confused as my sinuses!! Thanks for you good advice above. Wow Jerri. That’s the first time I’ve heard of a camellia taking so long to bloom. But thank goodness you stumbled onto a possible solution. I do think that by lightening the burden on the plant to perform, you are allowing what energy that is there to be directed in a more concentrated way. And hopefully this final step will see those blooms through to full bloom. Good luck and you’ll have to report back. I’m anxious to hear the rest of the story. My camillas are probably 5+years old. They are planted in large, very large separate planters. Under trees, facing north. They do have filtered light. I have moved the pots from one pace to another – until now at least I get buds on them. What am I doing wrong? I have yet to have ONE bud turn into a flower. Great site!